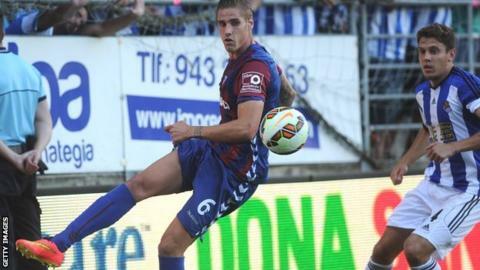 Head coach Steve McClaren has confirmed that Derby County want to sign Spanish centre-back Raul Albentosa. Albentosa, who has made 17 starts for Eibar in Spain's La Liga so far this season, has been linked with a £500,000 move to England. The 26-year-old helped his side reach the Spanish top flight for the first time in their history last season. "He is a player we like and we are trying to do a deal," McClaren told BBC Radio Derby. "That's proving difficult. But knowing Chris Evans [head of football operations], he will get there in the end."